Hannah Pietila keeps an eye on her tee shot at No. 7 during play Thursday. SPRING LAKE – Brighton’s Hannah Pietila is trying not to think too far ahead in the 99th Michigan Women’s Amateur Championship at Spring Lake Country Club. But her sister Emmie won this championship in 2012, and the University of Tennessee golfer like her sister, would like to pull it off too. Pietila, 16-year-old AJGA All-American Allyson Geer, who is also from Brighton, 2014 runner-up Hailey Hrynewich of Muskegon and recent Michigan Junior Amateur champion Sarah White of Caledonia each won two matches Wednesday and make up the semifinalists. Pietila meets Geer, and Hrynewich takes on White in morning matches Friday. The two winners will meet for the championship in the afternoon. Pietila, 20 and a junior this fall at Tennessee, beat 18-year-old Cordelia Chan of Birmingham 4 and 3 in the morning round of 16, and then topped Northern Michigan University golfer Avery Rochester of Marquette 4 and 2 in the afternoon. It was Rochester who in the round of 16 had knocked off Michigan State golfer Gabby Yurik of Oakland Township 2-up. Yurik shared qualifying medalist honors earlier in the week with Hrynewich and Geer. While Pietila was ending matches early, Geer was pushed to the limit in both of her matches. She trailed Northern Illinois golfer Sydney Brickey of Burtchville often in the round of 16 only to make a fast-rolling 45-foot putt on the 18th hole for birdie and the 1-up win. In the semifinals, again she trailed, this time against Bowling Green State University golfer Hannah Lewis of Plainwell before tying the match on 18 with a pitching wedge shot to three feet for birdie. She then won with a par on the first hole of sudden death with Lewis had tree-line issues after missing the fairway right with her tee shot. Geer, who is home-schooled, said she was excited to be playing Pietila, who she said played high school golf with her older sister. White is having fun, and for the third time in a match play tournament this summer beat Spring Lake’s 16-year-old Anna Kramer, whose parents are members of the host club. 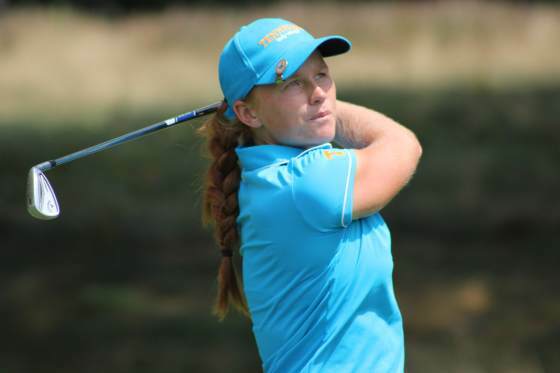 “We played in the Western Women’s Junior, then in the GAM Junior, then today and it is always great playing Anna because she is so tough,” said the 18-year-old former East Kentwood High School star who is headed to Western Michigan University in the fall and slipped past Kramer 1-up. White, who beat Grand Valley State golfer Gabrielle Shipley of Hastings 2 and 1 in the morning, said her play the last two days was her most consistent of the summer, and she is excited to play against Hrynewich because the families have connections through golf and hockey. Hrynewich, 20 and a junior-to-be at Ohio University this fall, is having a great summer, too. She was low amateur in the Michigan Women’s Open, qualified for the U.S. Women’s Amateur and was medalist earlier in the week. She plans to stick to her game plan on the Spring Lake course. “I kept making pars and sticking my shots by the pin and maybe the other girls felt some pressure,” she said after outlasting University of Akron golfer Pader Her of Lansing 2 and 1 in the round of 16, and then topping Western Michigan University golfer Emma Salata of Ann Arbor 4 and 3 in the quarterfinals. The match play bracket, more information and a photo gallery are at www.gam.org. The semifinal matches go at 8 a.m. and 8:15 a.m. Friday. The championship match will follow in the afternoon. Hailey Hrynewich, Muskegon, 20, Ohio University golfer (junior) Fast fact: She models, sells cosmetics for Mary Kay but is studying sports broadcasting and wants to be a hockey announcer. Sarah White, Caledonia, 18, Western Michigan University golfer (freshman) Fast fact: She was the Division 1 high school state individual champion for East Kentwood High School in 2015. Hannah Pietila, 20 Brighton, University of Tennessee golfer (junior) Fast fact: She is one of eight kids, including five girls and everybody is in the family motor home in Spring Lake this week. Allyson Geer, 16, Brighton, home-schooled (junior) Fast fact: A highly ranked junior golfer, at age 14 she decided she wanted to play college golf at Michigan State University and made a verbal commitment for the class of 2017. Hannah Lewis d. Nichole Cox 4 and 2. Geer d. Lewis in 19 holes.